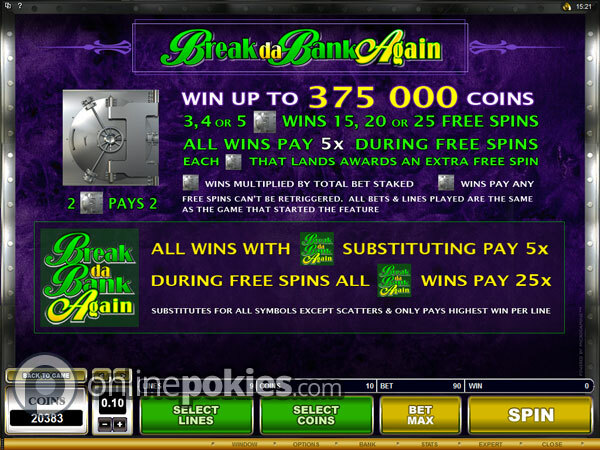 Break Da Bank Again is a nine line pokie game with free spins and a gamble option. The standout feature is the free games where wins with a wild are multiplied by a big 25 times giving a potential jackpot of 375,000 credits. 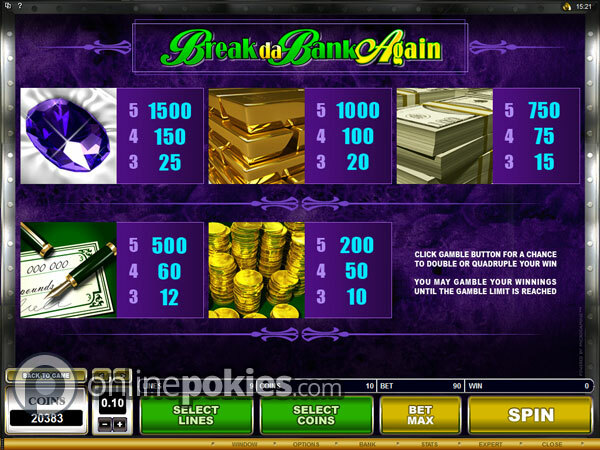 Break Da Bank Again is a nine line pokie that follows on from the original five line game. This version keeps the X5 and X25 multipliers but adds in free spins and a gamble option. The game has a high volatility which makes for a boom or bust game. 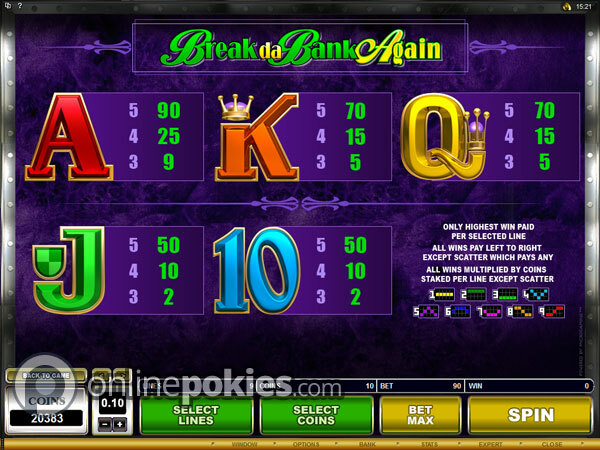 Play Break Da Bank Again at bet sizes starting at just 9 cents. You can bet more (up to $45) by either increasing your credits per line or by increasing the credit size (1c to 50c). The Break Da Bank Again logo is wild for all symbols except the scattered Safes. During regular play any win with a wild is multiplied by five. While you can get five wilds there is no specific pay for the wilds so you get the top jackpot of 1,500 credits for the five Gems or 15,000 credits if you're betting the max 10 credits per line. 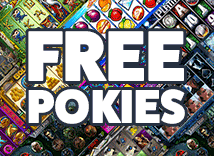 Get three, four or five of the scattered Safe symbols and you win 15, 20 or 25 free spins. The free games cannot be re-triggered but each Safe that appears on the feature adds one extra free game. This is similar to the way the scatters work on games like Aristocrat's Super Bucks 4. During the free spins all wins are multiplied by 5 and any win with a wild is multiplied by 25 which gives the potential for a 375,000 credit jackpot if you're playing max bet. With the high volatility the free spins can either be massive or terrible. It's not uncommon to get only a very small win on the feature. However any win with the X25 multiplier is going to be big. 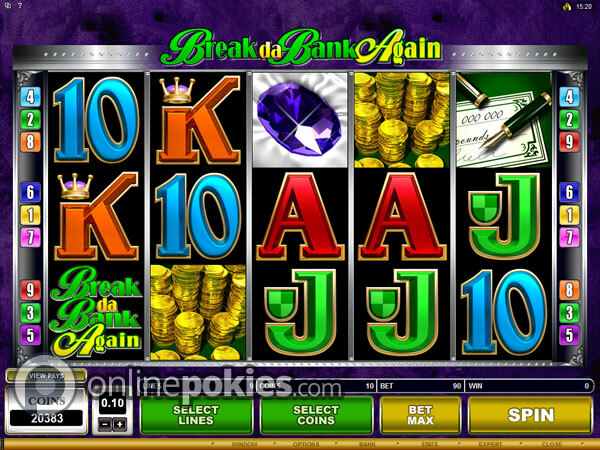 Break Da Bank Again has an Australian style gamble option where you can gamble your wins on either red or black or the suits. You can keep doubling up until you reach the gamble limit which varies from casino to casino. There is a Mega Spin version of Break Da Bank Again where you can play four sets of reels at once. At first look it would appear that this version is like More Chilli and More Hearts but this is not how the game works as you just have four individual games running at the same time.